July 26, 2013 - CelticRadio.net - Called the Allman Brothers of Celtic fiddle bands, only prettier (Mike Weekly, Pottstown Mercury), Burning Bridget Cleary features the remarkable musical talents of Rose Baldino and Deirdre Lockman, who lead the band with high-energy and tightly woven harmonies in both fiddle and vocals. The driving rhythm and bass end is supplied by Philadelphia native, Lou Baldino on guitar, and percussionist, Peter Trezzi, on djembe drum. BBC has played hundreds of performances along the East Coast, and produced four CDs. Their second production, Everything is Alright, was named 2009 Album of the Year by Boston-based CelticRadio.net. Their newest CD, Pressed for Time (June 2013), is receiving strong radio attention and praise, hitting #2 on the June Folk DJ Charts. 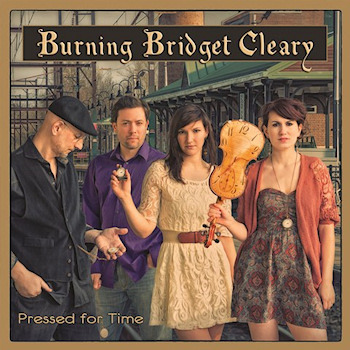 Burning Bridget Cleary is quickly conquering the spotlight of the Celtic and folk music scene internationally, hailed as an energetic and engaging live band, as well as a solid studio act that well represents the nuances and detailed history of the genre. The groups latest effort, Press for time set out to capture the evergreen feel of the Irish Folk tradition with modern production values, which highlight the highly skilled musicianship of the band members, doing a great job capturing the organic vibe of these talented performers. Although I find no fault in the bands recorded output, I feel that these recordings offer just a hint of what Burning Bridget Cleary can do on a stage, especially as a couple of stereo speakers are replaced by the human touch and all the intimacy these 4 talented individuals can offer to the audience. The connection with Ireland deepened even further when this group was able to extensively tour the country, even having the opportunity to visit their namesakes home (Bridget Cleary has been the protagonist in a dramatic occurrence, as she was reportedly killed by her husband (You can find more about it on the web if you are curious). Burning Bridget Cleary is a great example of the healthy conditions of Celtic folk. 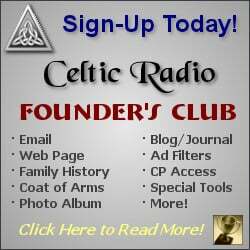 5 Stars from Celtic Radio!